Ok everybody, we just experienced a Twitterstorm of ideas! Katie, our friend over at Secrets & Sharing Soda AND Storytime Secrets tweeted about her need for two great innovative outreach ideas that she can implement before September. Now, concerns about the feasibility of this expectation aside, plenty of tweeps jumped in with great ideas and Mel--ever thinking Mel--noted that someone should grab these ideas from the ether and jot them down for everyone's benefit. So here we are with round one. Keep an eye on Katie's blog for more ideas and some follow-up on what she ends up doing! --Teen outreach at a comic book store--maybe during Free Comic Book Day (May 5th 2012), Teen Read Week (Oct. 14-20, 2012) or Graphic Novel Week (Not sure when/what this one is). --Afterschool programs outreach: Boys and Girls club, etc. 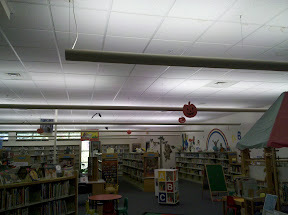 where librarian provides activities, crafts etc. Seth (Voices Inside my Headphones) suggests some online outreach--maybe a bookclub or something along those lines. Laura (Bib-Laura-Graphy) suggests looking into local shelters for family/domestic violence, or a local Children's Hospital (or even children's department of general hospital). and WIC offices as possible outreach locations. Lisa (Library Lady) suggests in-home daycare providers and public parks as possible outreach destinations. --First Job Program (aimed at highschoolers) on getting (and keeping!) a very first job (to make this outreach instead of in-house, you could partner with local tech school or Optimists club or maybe even Chamber of Commerce for your community! 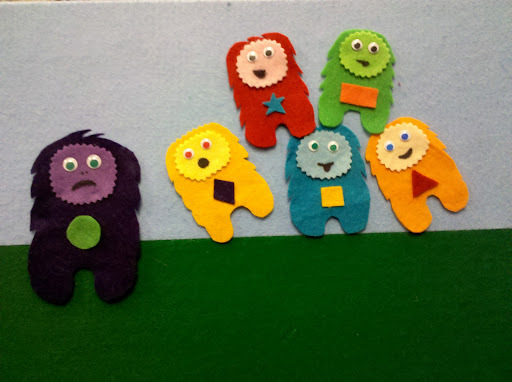 --Hospital's birth education classes/groups or MOPS--targeting parent education rather than kids. --Coordinate some kind of program for senior citizens/nursing home residents. 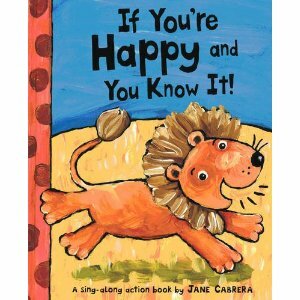 "Ray of Sunshine" visits from families with young children to elderly folks, or kids reading to seniors. This would have been ever so much more timely a month ago, but it was very successful so I'll still share it. I planned a party for the release of Cabin Fever, book six in the Diary of a Wimpy Kid series. 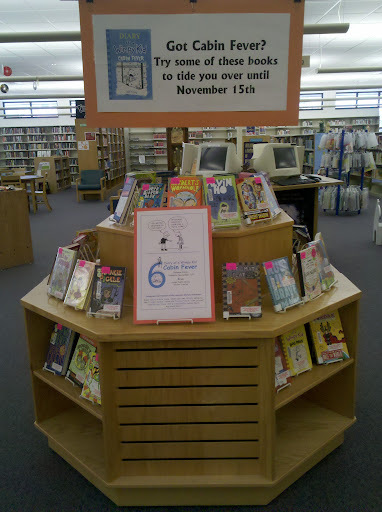 As a lead up, I put together a display of 40+ read alikes with an ad for the party. It was a pretty nice display, and since it is right in front of the main doors to the library it got a lot of attention. It was really nice for staff too, since they could direct patrons to the display if (IF! HA!) 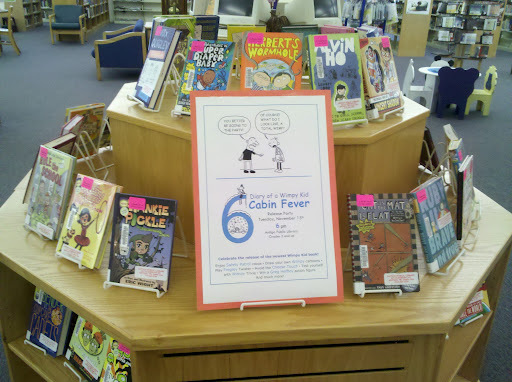 all of our copies of Cabin Fever were checked out. 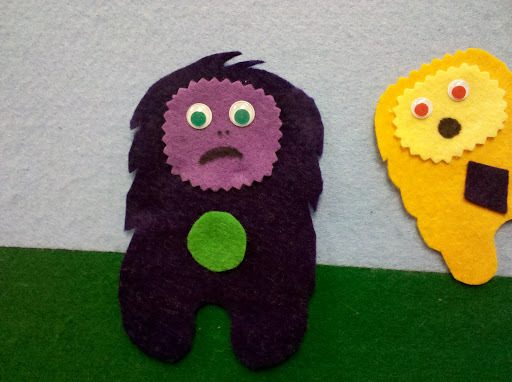 Today I bring you felt finger puppets! 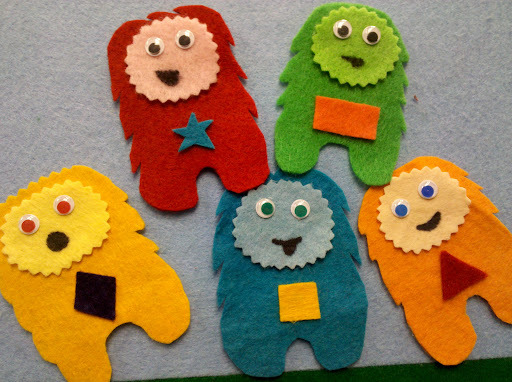 The finger puppets are made from simple shapes cut in felt, layered together and stitched. They could just as easily be glued if you're not a sewer. But if you want to try hand sewing, nothing is more forgiving or fun to work with than felt. Here's what I do with Santa. 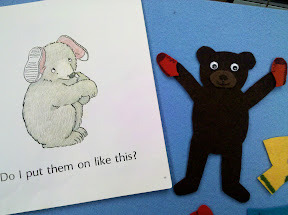 I love this simple fingerplay, and so do kids. Especially when they don't know that I have a finger puppet on! Sung to: "If You're Happy & You Know It"
There's a little elf that's sitting on my nose, Uh Oh! Now there's no little elf on my nose. Clip art for "Call Rudolph"
I ended up not enjoying this one when I did it before. It was TOO LONG, and the joke at the end just really fell flat so I'll be on the lookout for other rhymes to use my Rudolph puppet. 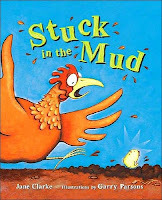 Our round-up is hosted internationally this week, by Library Quine over in Scotland! 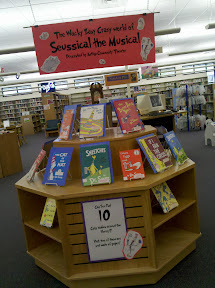 Our local community theater is staging a production of Seussical the Muscial opening the first week of November, so I put together a display using all the books that are part of the musical. Since there aren't a ton of books, I made liberal use of the color copier. I photocopied the cover of each title(after cleaning and fixing them all up--eesh) and mounted them on blue construction paper. That way if the books get checked out the display will still look full and attractive. 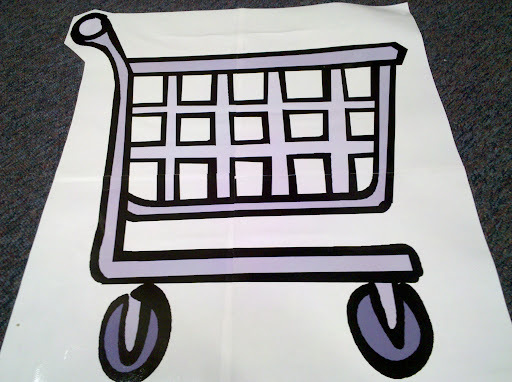 I use Microsoft Publisher to make my signs. The font is Grinched, a free font that I downloaded--I LOVE it. I spent some time on the Dr. Seuss website Seussville, and printed some characters from the different activity sheets available there. And, in a last minute bright idea, I whipped up a little game! 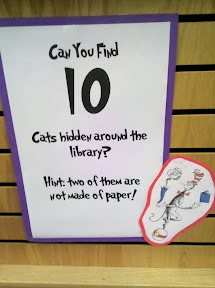 We have a mural that includes the cat in the hat, and a spooky Halloween cat up right now, so kids may or may not include those in their 'ten' that they find. 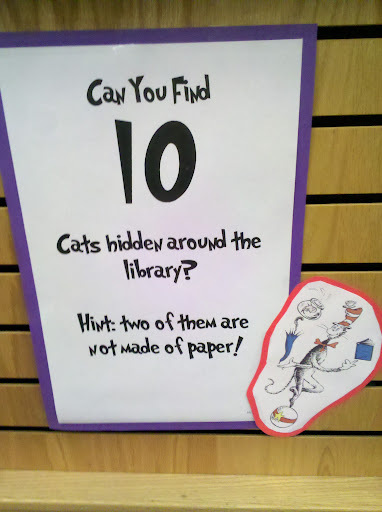 I actually put out nine paper cats around the library so it won't be too hard of a challenge. 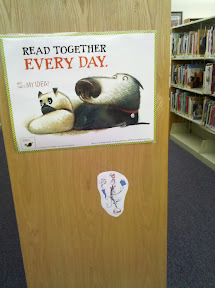 Took me ten minutes tops to print, cut-out, and tape these up around the library! A few weeks ago when I hosted the Flannel Friday roundup I fell head over heels in love with Cate's creepy monsters. 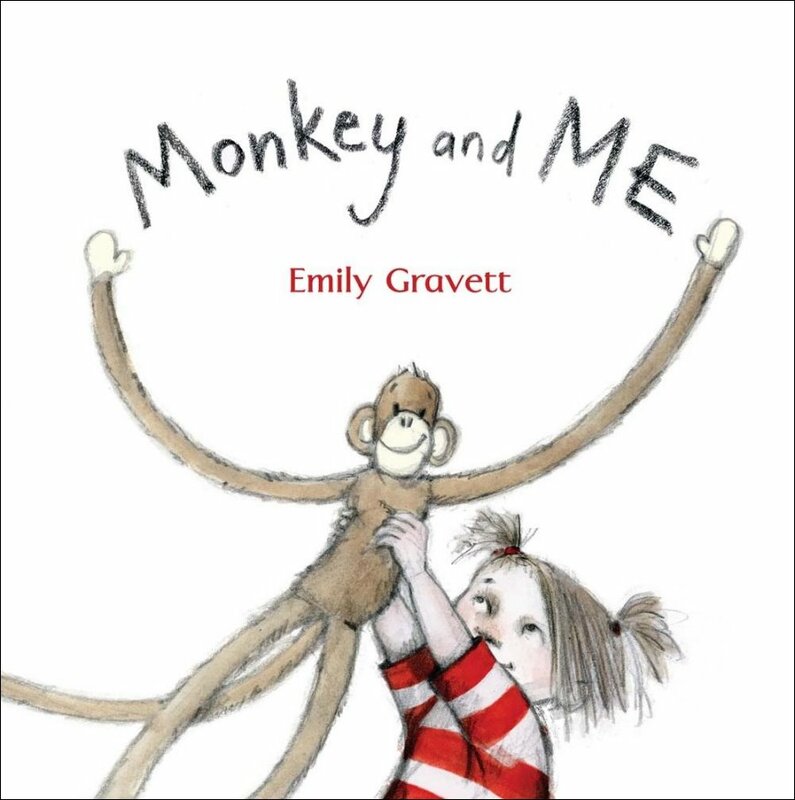 I NEVER sing 'Five Little Monkeys on the Bed" in ST--I dunno why, just bored by it, I guess? But, monsters jumping on the bed?! I'll use those adorable little guys all year. 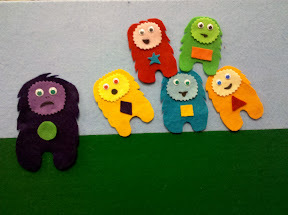 I didn't even really try to branch out, Cate's monsters were sooooo cute. So my "inspired by" is more like direct imitation. I did add a Mama Monster. And I chose different colors/decorations for my lil' creepers. I chose different belly shapes so we will have more options for things to discuss in ST--shapes, colors, emotions. Five little monsters sitting on the floor. The [red] one said, "Let's knock on someone's door." The [green] one said, "Let's act a little scary." The [white] one said, "Why are we so hairy?" The [blue] one said, "I hear a funny sound." The [pink] one said, "There's no one else around." Then "WHOOSH" went the wind and "EEK!" someone said. If I used that rhyme, I would probably stick with using ordinal numbers instead of colors. 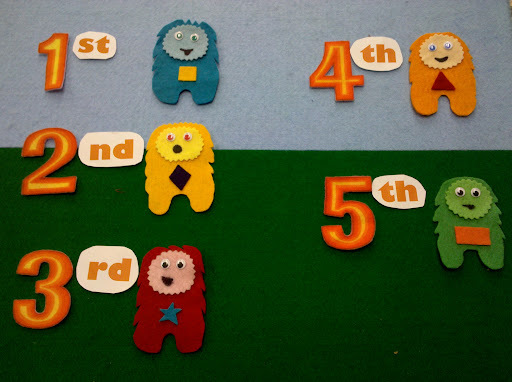 I don't often use a, "Five Little Whatsits" rhyme, but when I do I like to use it to practice/introduce counting with ordinal numbers. "First, second, third, fourth, fifth!" 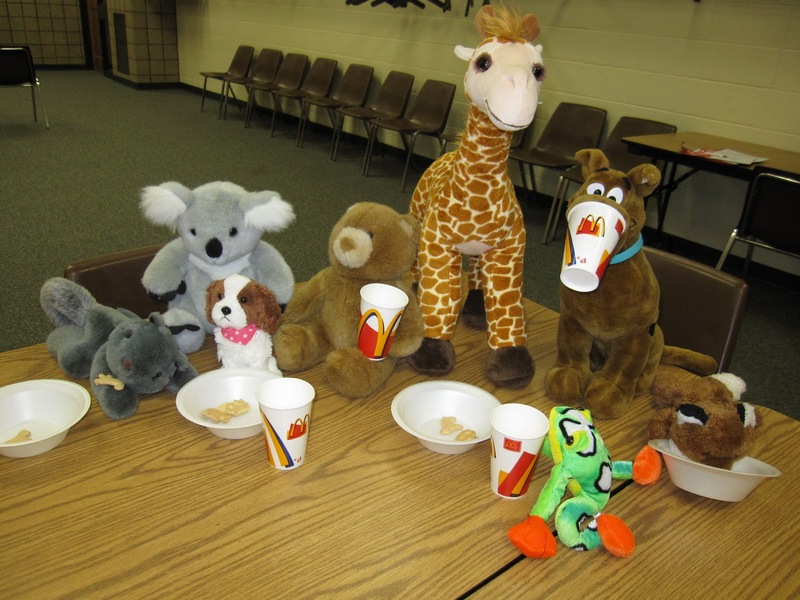 Check Mollie's Blog for this week's full round-up. Just had to share a few shots of the fun we had at the Teddy Bear Sleepover. 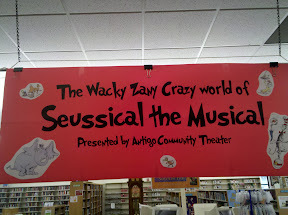 Yesterday I posted what we did in storytime for this event. 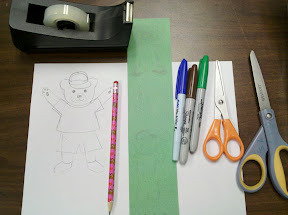 After storytime for the craft, each of the kids drew a picture of his/her stuffed animal on a piece of regular sized blank paper. They also filled in their Teddy's name, age, favorite color, and favorite book. 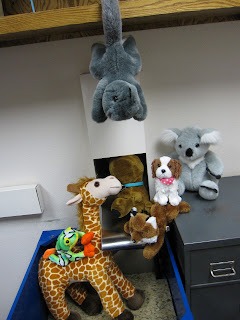 Then they said good night and tucked their teddies in. Once I had all the pictures, I put together two 'scrapbook pages' with captions. 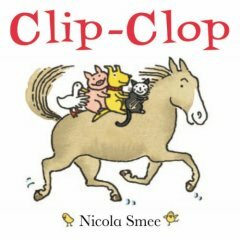 One page was the same for all the animals, and the second page I customized with pictures highlighting the animal whose book it would be. 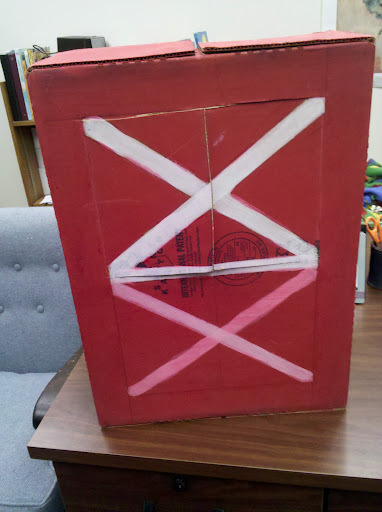 I took the really large construction paper--12x18?--and folded that in half. On the front I taped the page the kids filled out with the drawings of their animals, and on the inside I taped the two 'scrapbook' pages full of pictures. When the kids came in the next day to retrieve their friends, they got a memory book with pictures of what happened while they were away. It was a smashing success and I can't wait for the next one! 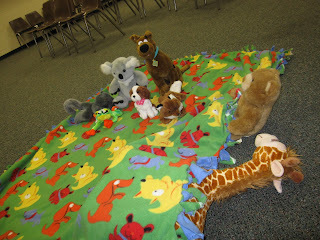 Had my first Teddy Bear Sleepover at the library! It was amazing, and I can't wait to do another one. For storytime we--of course--did a stuffed animal theme. 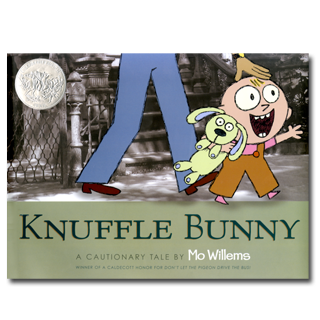 We started out with Mo Willem's Knuffle Bunny. It was, of course, lovely. 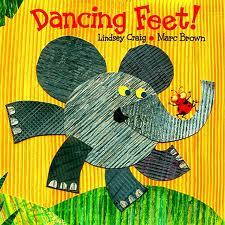 I have to admit, I was never a huge Mo fan until he started writing Elephant and Piggie. I mean, I liked him, but I wasn't totally on the Mo train until those two came along.﻿ And yeah, Knuffle Bunny Free made me tear up earlier this year. I love that book! 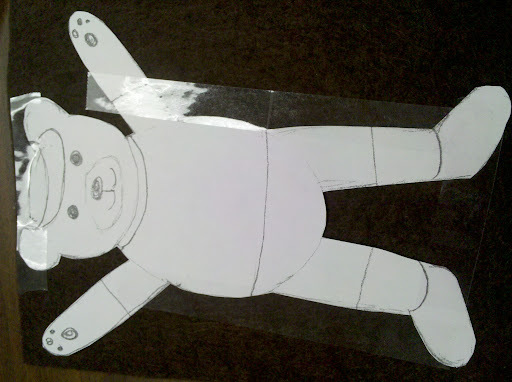 Next I got out my big lap-sized bear puppet. My arms go inside his arms, so I can make him do motions. We sang, "I Had a Little Turtle" but changed it to "I Had a Little Teddy." Five little teddy bears standing side by side. 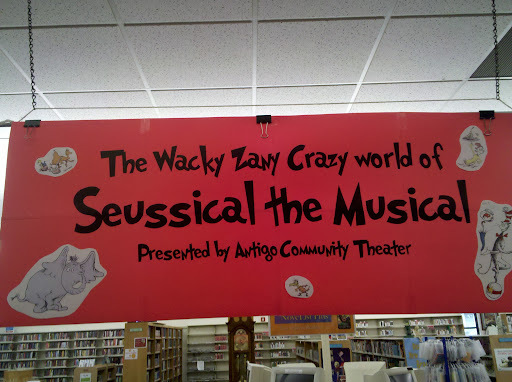 I wanted it to be very action-oriented so the kids would get involved. 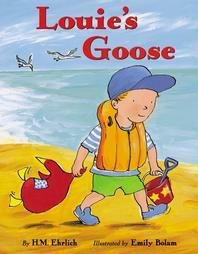 H. M. Ehrlich's lovely little book, Louie's Goose was next on the agenda. 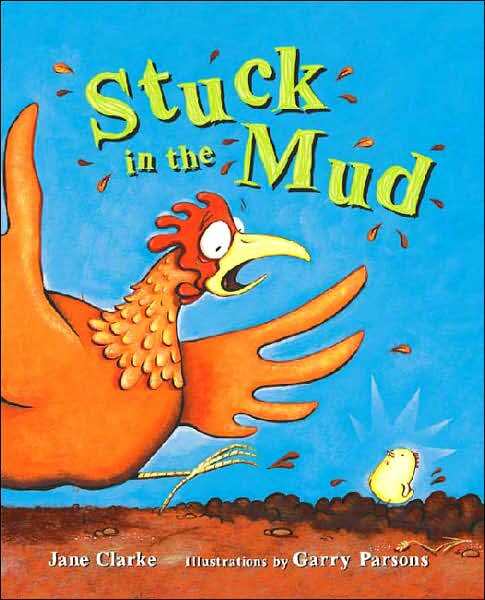 This is a sweet little book that I really like--Rosie the goose gets loved to pieces, and mom and dad can only do so much to save her. Then Louie has to take matters into his own hands. 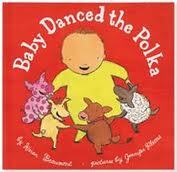 Then we got rid of wiggles and giggles with the Watermelon Song. and D is for Don't sit down/is when we all sit Down. (We sign A, B, C, D as we do this). Finally, we finished up by reading Emily Gravett's Monkey and Me. 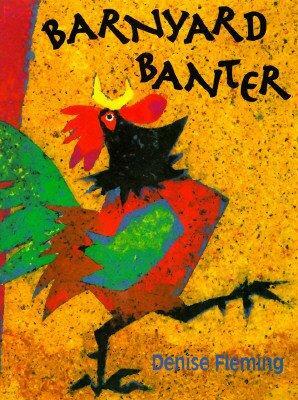 I just love this author, and this book in particular. 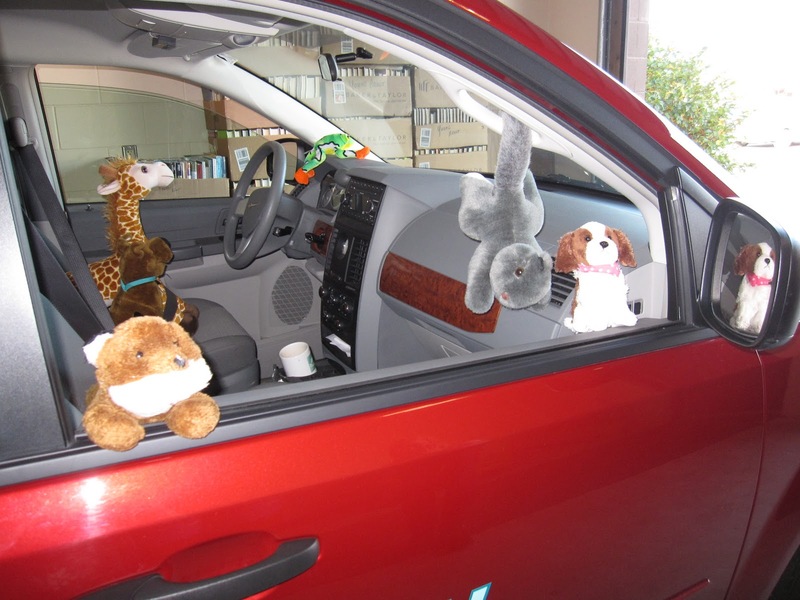 The kids love joining in on the rhythmic refrain and guessing what animal the girl and her toy are impersonating. Closing song: Storytime is Over Now. Good morning, duckies. 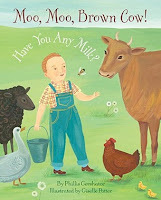 Today I am sharing a little ditty inspired by this post from Mollie at What Happens In Storytime. Go take a look, then I'll show you what I did. I used Microsoft Publisher to print the image over several sheets of paper so that it's about the size of a piece of posterboard. 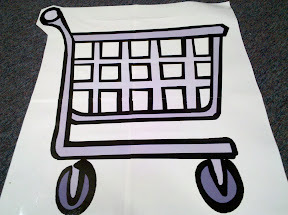 I laminated it and taped magnets to the back, so that I could use it with my chalkboard/easel. 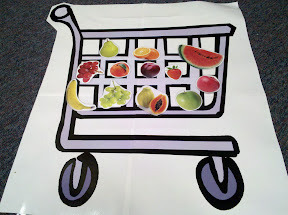 Next was the really fun part--finding all my fruit images! 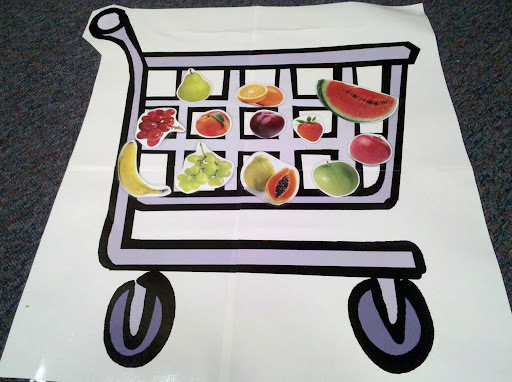 I mainly used the clipart in Word again, and chose all photographs of fruit so it would be consistently realistic. I made sure to include all the fruits mentioned in the Watermelon Song (our favorite!). 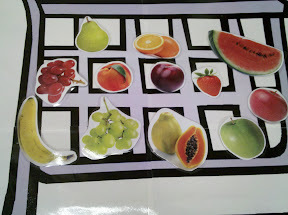 The fruit was all cut out, laminated, and magnetized as well. 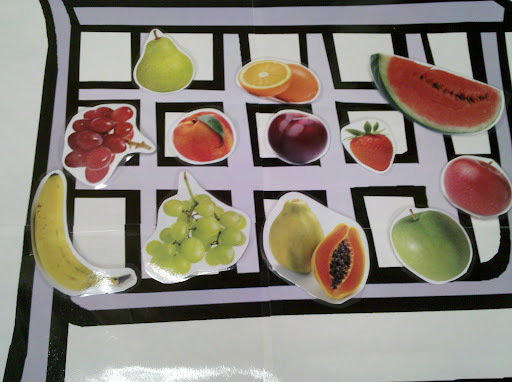 We talked about the differences and similarities between the different fruits, and of course the kids LOVE to come up and put things on the board. Normally I have too many kids to let them put things on the board, so I love this one because I have so much fruit everyone can play. 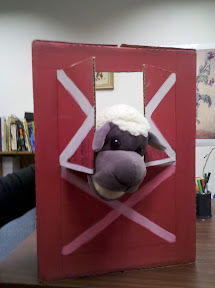 Check Andrea’s Roving Fiddlehead Kidlit blog for the Flannel Friday roundup later today. If you want to participate, leave Andrea a comment (and a link to your post). If you have a great flannel you'd like to share but can't get it posted by the end of the day today, just save it for next week's roundup! And if you don't have a blog email one of us who does and we'll get you included. Halloween is coming! But uh oh, what's that? 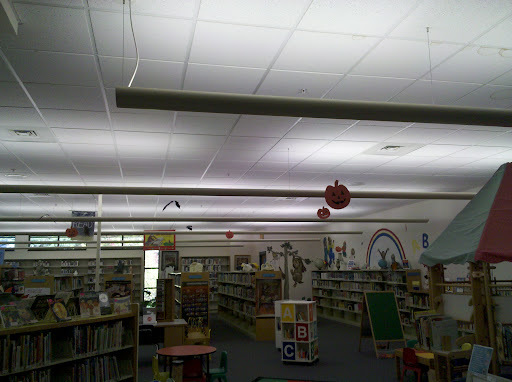 We recently changed a policy at the library, which I knew would be hard on kids who don't have money or involved parents. So in anticipation of this, I offered the kids a way to 'work' for me. Since Halloween is coming, I had them cut out some decorations. 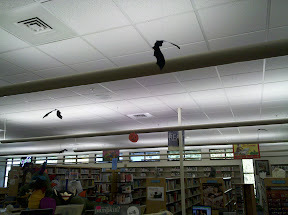 I LOVE how floppy and kind of realistic the bats turned out! 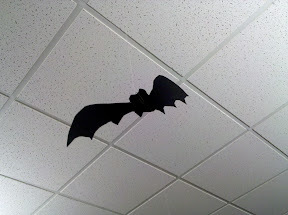 The bats are made using this clipart. I made it as large as I could on a regular 8.5x11 piece of paper and printed a template on cardstock for them to trace onto construction paper and cut out. I used this Jack-o-Lantern and again made a cardstock template. I cut out the eyes and mouth using an X-acto knife so they could just color in those features like a stencil. When I first started here, I spent a day with the ladder, stringing fishing line from the ceiling tiles and tying paper clips to the ends. 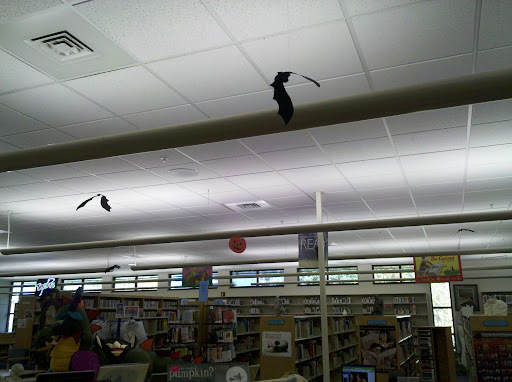 I leave them up all the time, and just paperclip new decorations on according to the season. It's so easy! When they're empty, they're practically invisible. 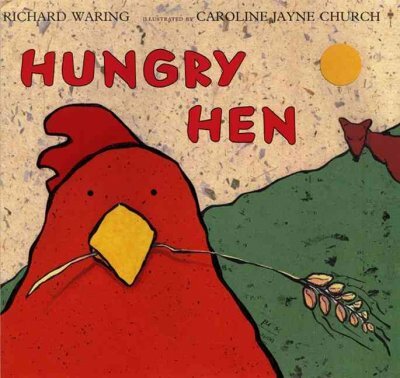 The best thing is that I have this song in my head all the time now. Everybody's welcome to join in! Have one to add? I will, of course, edit you in if you leave me a comment. Edited to add: At this point, if you still have an entry, you'd do better to save it for this coming Friday so more people to see it--Andrea will be hosting. Thanks everyone! Mary brings us not one but TWO boards this week, an adorable clip art version of the book Mortimer and flannel props for the song Mary Wore Her Red Dress (argh, Twitter's hashtags not searching correctly, Mortimer was from a few weeks ago. It's still super cute though). Anne tries out a new material for flannelboards and shares several stories made with--Milk filters! Alison brings us an idea for the every popular dinosaur theme--Paleontologist Paleontologist What Do You See? Library Quine adds her take on the book, Go Away Big Green Monster--a book I'm looking forward to using again this Halloween as it's a favorite of mine. 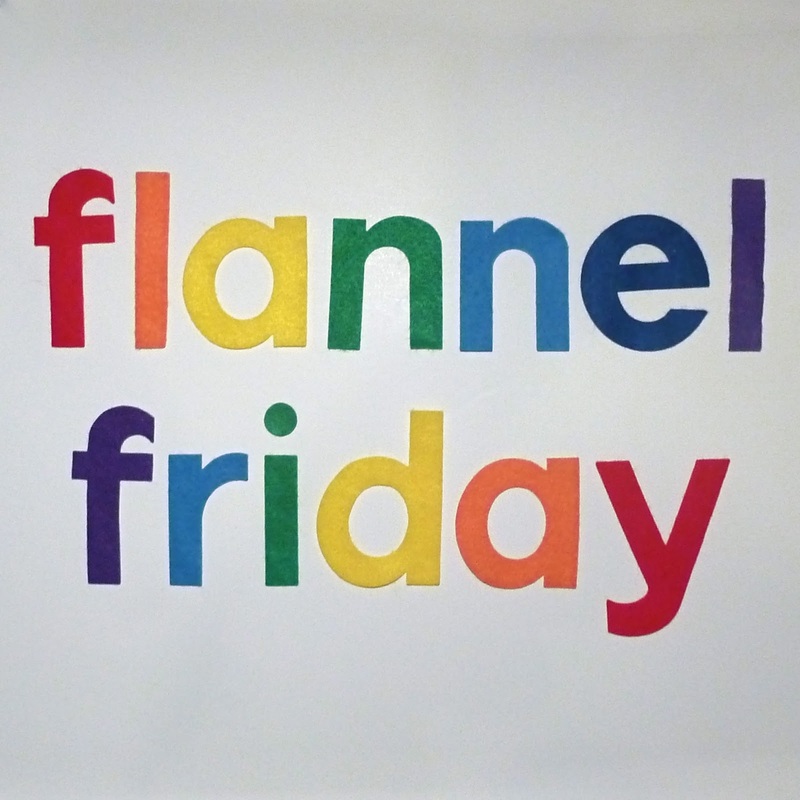 Click the icon on the side of my blog to go to the Flannel Friday Pinterest account. If you'd like your own badge, go to Mel's page to get the code (on the right hand side of the page). 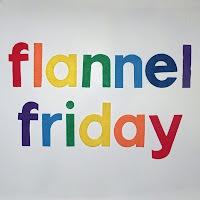 Archived Flannel Friday roundups are stored on Anne's blog, along with more information on what's going on here if you're new or curious. A quickie from the ST files. 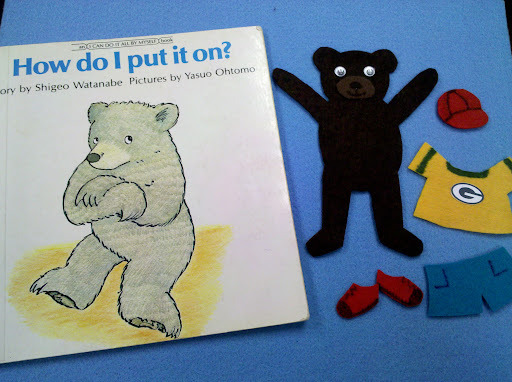 I whipped this clipart baby up one morning juuust before storytime. 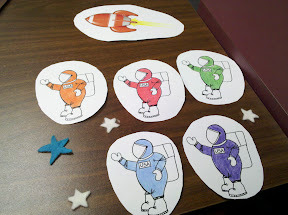 Colored the astronauts with colored pencil and found some felt stars for ambiance. Looking at the stars with a smile on their face. 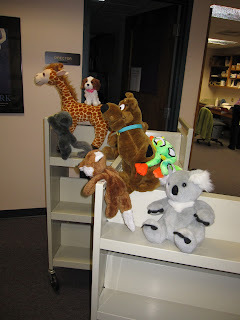 When along came a space ship to beam one out and the 4 little astronauts gave a big shout "HEY"
I got this idea from the amazing puppeteers at Neenah Public Library during the 2009 WLA conference. Take a box (B&T boxes are so great since they have a flat bottom). Paint it to look like a barn door. Don't worry, you don't even have to do that good of a job--the kids won't care. Now when you sing Old Mac you POP the puppets through the door. "Old MacDonald had a farm, E-I-E-I-O. And on that farm he had a...COW!!!" Sometimes I put in a big pause and really punch the animals through. Half the kids jump, and then they laugh and laugh. I always tell them when we've seen all the animal friends in the barn, but maybe if we all sing nice and loud one of them will come back for an encore. 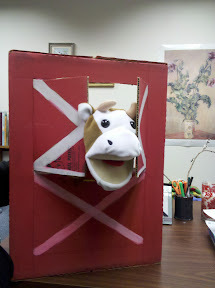 Usually it's cow who comes back, and he moos with gusto before saying goodbye to the kids. 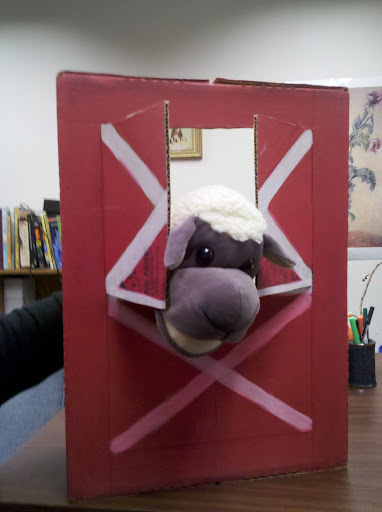 I use this once a month or so regardless of my theme, but sometimes I'll put in a weird animal who relates to the theme or something to surprise the kids--like at Halloween the sheep 'dressed up' as a ghost when he popped out. So much fun and easy to do! So, I jettisoned my to-do list and made a flannel today. It felt good. I've really missed actually working on things for storytime. The simple yet delightful, "How Do I Put It On?" by Shigeo Watanabe just begged me to turn it into felt. Little Bear photographed really dark--sorry! 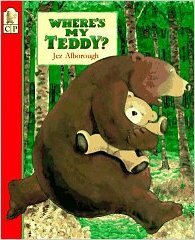 First I looked at the illustrations in the book, and did a Google image search for bears to figure out how I wanted him to look. I knew he'd need long legs and arms to put the cloths on. Then I did a small sketch (on the green paper) to test out some ideas. Once I had it how I wanted it, I sketched him onto a clean sheet. 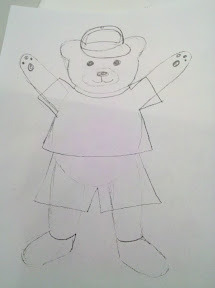 then I lightly outlined the clothes shapes so that they would be the right size. Next I enlarged my drawing on the photocopier so it would be better for group viewing, and made two copies (one for the bear shape, and one for the clothes). 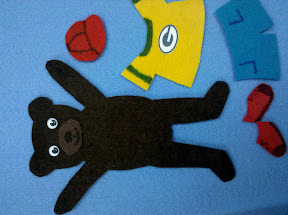 Then I used my paper scissors (the orange ones) to cut out my pattern for just the bear. I taped that to the felt and then cut the felt with my cloth scissors. Taping the pattern on works wonderfully--I just cut through the tape. Paper dulls scissors very quickly, and cutting cloth with dull scissors is a nightmare, so I'm very careful to use different pairs for different materials. I did the same thing for the clothes, and then I added details with markers using the dabbing approach rather than a dragging/writing motion. Can't turn it without starting over. I gave him a Green Bay Packer shirt because I know my audience, and it will delight many of the little boys in my storytimes. I printed the logo on paper and glued it on. I'd be happy to share my template if anyone wanted it.